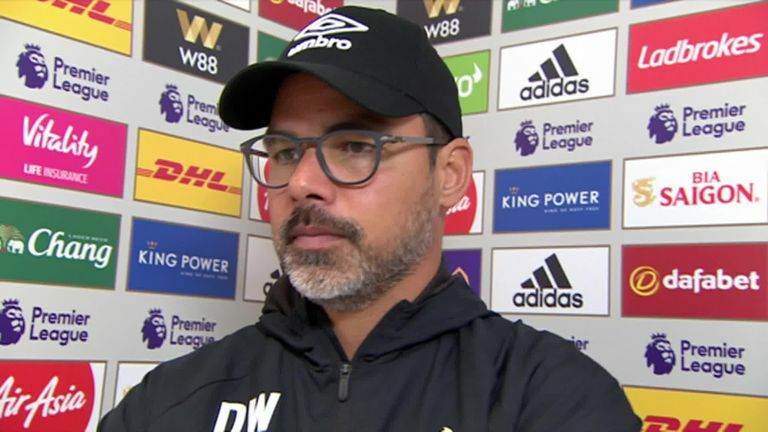 "I'm very disappointed because I think everybody has seen there was something in the game for us," David Wagner told Sky Sports. Huddersfield manager David Wagner bemoaned the individual errors which cost his side during their 3-1 defeat to Leicester. Wagner's side are bottom of the Premier League after squandering an early lead at the King Power Stadium. Mathias Jorgensen put the visitors in front early on with only their third goal of the campaign but Kelechi Iheanacho quickly equalised before second-half goals from James Maddison and Jamie Vardy sealed victory for Leicester. And Wagner was disappointed with the goals his side conceded, saying they were presents. He added: "It was a good away performance. You can't ask for more clear-cut chances than we had and defensively we looked very solid but as I said before, the goals we gave away were presents. "We conceded two counter-attacking goals against Leicester City away from home which makes absolutely no sense. That's why it's disappointing because there was something in the game for us." Huddersfield remain without a win so far this season and have just two points from their opening six games. However, Wagner is remaining positive, saying his side will start to pick up points but only when they start to cut out their mistakes. He said: "I said to them that if you make mistakes as we've done you will not get something out of the games in the Premier League. However, they've shown that the gap between us and the other teams, there's not a lot between us, but you have to avoid these mistakes.